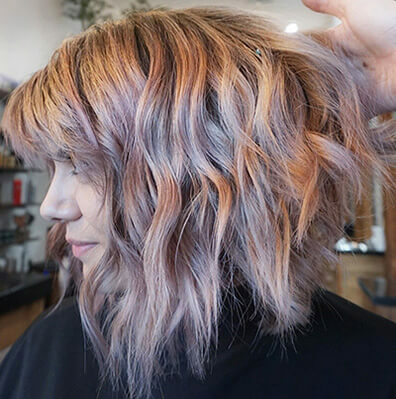 “The more pastel the tone, the higher maintenance the color will be. Be sure to wash the hair in lukewarm or cold water, and no more than twice a week,” advises Larisa, who likes to dilute Pink Color Butter with conditioner to keep up the gentle pastel tone. 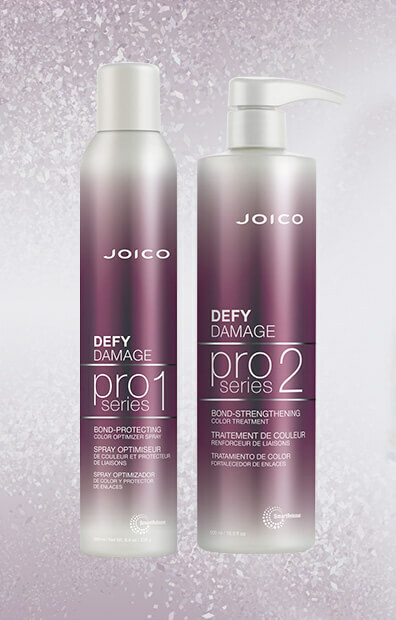 Step 1: Spray Defy Damage Pro-Series 1: Bond-Protecting Color Optimizer on each sliced section; comb through for even distribution. Step 2: Lift hair with Joico Blonde Life Creme’ Lightener, starting with 20 Volume and working up to 40 Volume LumiShine Developer with a full head of highlights. Step 3: Pre-tone with LumiShine Demi-Permanent Liquid Color in 9V + 8N with 5 Volume LumiShine Developer. Step 4: Wash out and glaze with Joico Color Intensity Blush and Silver Ice ok dry hair for 20 minutes. Step 5: Rinse and apply Defy Damage Pro Series 2: Bond-Regenerating Color Preserver and style.